NBC's David Gregory, on Wednesday's Today show, downplayed the huge GOP wins in New Jersey and Virginia as merely reflecting the "anti-incumbency mood," and "the change message that Obama" started last year. Gregory, however, did play up Democrat Bill Owens' win over Conservative Party candidate Doug Hoffman in the New York 23 congressional race, and even more absurdly Bob McDonnell's win in Virginia as evidence that the Republican's path to victory is to go moderate, as the Meet the Press host postulated: "What's striking is you have the results in New York 23, which Democrats will hold up as a great result for them, but then you have McDonnell winning in Virginia, a purple state. He's a social conservative for his political career, yet he runs more as a pragmatist, as more of a centrist and look at the result. He wins big, wins big among independent voters." 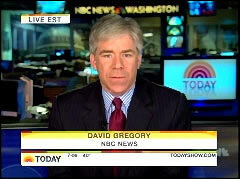 MEREDITH VIEIRA: David Gregory is the moderator of Meet the Press. Hey good morning to you, David. VIEIRA: As Chuck, as Chuck just reported, the President did stump for the two losing gubernatorial candidates in New Jersey and Virginia. Republicans are saying this morning it is a repudiation of the President's administration. Fair statement or overstated? GREGORY: Well probably unfair when it comes to a repudiation of the President himself, because his own approval numbers in New Jersey and Virginia are still quite high. But as Chuck points out, it's the Obama coalition that was so successful in 2008 that did not show up. Independent voters, younger voters, African-American voters. That was part of a unique coalition that he put together for his presidency. This anti-incumbency mood is significant. It says that, that change message that Obama carried on to victory is still holding true, but now it's being used against Democratic incumbents. VIEIRA: Yeah, you mentioned the independents. And as you pointed out, they went heavily for Obama in 2008. This time they went with the Republicans. So, what is the lesson that both the Republicans and Democrats should take away from that? GREGORY: Well, again, it's the anti-incumbency mood, it's the fact that there's less trust of government, that there's a disaffection with both parties, which is why I think this New York 23 race is important, because it's a fight between conservatives and moderates in the Republican Party. For Republicans, they make the argument here that the independent wave is part of a different atmosphere, that there's concern about the debt or health care, some of Obama's policies, some of the Democratic policies. That's the message that they hope to build on and they will try to nationalize that message today and going forward. VIEIRA: Let's talk a little bit about the congressional race in the 23rd district in New York. It, it sort of pointed out the dissension within the Republican Party between the moderates and those that are, are far more conservative. In the end, it was the Democrat who, who won that particular race, so how does the outcome of that race factor into national politics? GREGORY: There's still gonna be a big fight in the Republican Party about what the party should be. Should it be a more conservative party that gets back to its smaller government days or should it be a moderate party that can change some positions to get more independent voters to expand that coalition? What's striking is you have the results in New York 23, which Democrats will hold up as a great result for them, but then you have McDonnell winning in Virginia, a purple state. He's a social conservative for his political career, yet he runs more as a pragmatist, as more of a centrist and look at the result. He wins big, wins big among independent voters. So that dynamic within the Republican Party, that fight about what it wants to be is gonna go on. VIEIRA: And finally David, you know midterm elections are next year, do you think that legislators will be looking at the results from last night and recalculating how they're gonna come down on tough issues like health care reform? GREGORY: It's gonna be a real fear within the White House that those moderate Democrats are gonna now find it more difficult to cast a difficult vote on health care that could increase the deficit, that may be unpopular with key parts of their constituencies as they face voters next year. That's something that the president is gonna have to really work on. VIEIRA: Alright. David Gregory, thank you very much.